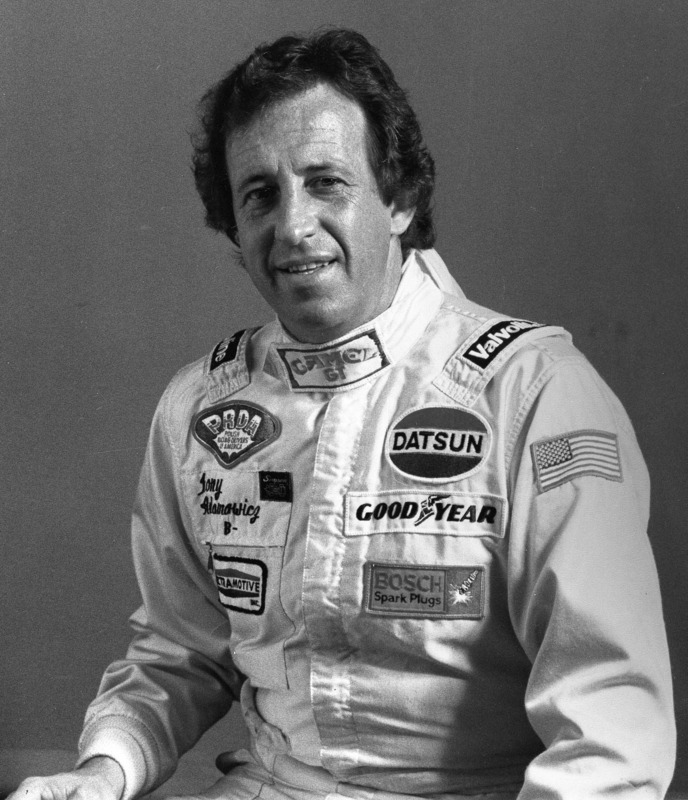 Tony Adamowicz began a storied racing career in 1963 and was highlighted by several major professional driving titles. He won the 1969 Formula 5000 Championship, the Trans Am season championship and three International Motor Sports Association season championships. In the Polish tradition, Violet and Walter Adamowicz named their first-born son, Anthony Peter, after his grandfathers. Tony A to Z, as he came to be known, was born on May 2, 1941 in Moriah, New York. Both of Violet’s parents were from small villages in Southern Poland. Walter’s parents came from the Wilno region of what was then Northern Poland. Immigrating to America at the beginning of the 1900s, they each followed their dreams toward freedom and opportunity. In the small village of Port Henry, New York, in the heart of the Adirondack Mountains, Peter and Helen Adamowicz became proprietors of an inn and operated a grocery store serving a sizeable Polish population in the neighborhood. Tony’s father eventually took over the store, and from him, Tony learned practical lessons: Work hard. Do your best with the tools at hand. Never give up. Tony’s grandfather and father possessed a love of cars and enjoyed servicing their personal “workhorses.” Fueled by their interest, Tony became fascinated by racecars, particularly the Ferrari. He read about drivers like Juan Manuel Fangio and races at places such as Le Mans. As a teenager, he honed his skills driving the winding roads around his hometown and felt the thrust and power of manipulating the “rock cuts,” predecessor of future chicanes. Tony discovered his dream. While serving in the Army in the White House Communication Agency, Tony found the Maryland roads around Camp David reminiscent of his earlier driving thrills. In 1963 he raced locally, and won. In 1964, after perfecting his Volvo’s engine, he finished 2nd in the Northeast SCCA Region B-Sedan Championship. In 1965, he won that same Championship. His racing career had begun. This polite young man with a charming smile was very fast. He was consistent. He was also skilled mechanically. In 1966 Tony won the SCCA Trans Am in Sebring and the 12 Hour Trans Am Sedan Race in Marlboro, MD in a Dodge Dart, the first time an American car had won that event. In 1967 he drove a Lotus Cortina and a Triumph Spitfire, placing 2nd in the Northeast SCCA Region. 1968 saw Tony well on his way to a world-renowned career. 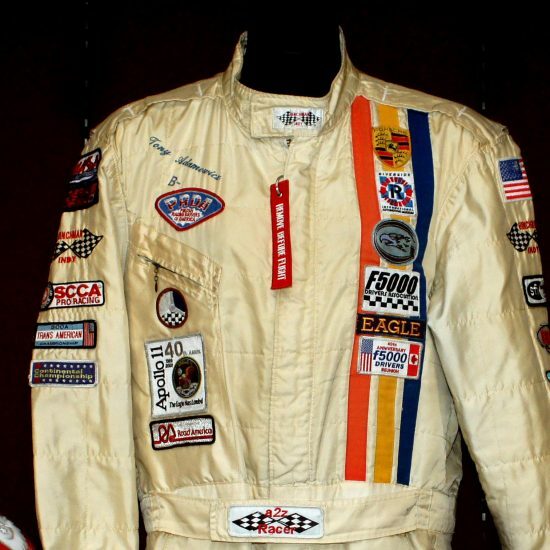 He captured the Trans Am Under 2 L Championship in a Porsche 911, amazingly winning 6 of 10 races, finishing 2nd in two others, and setting 5 new lap records. 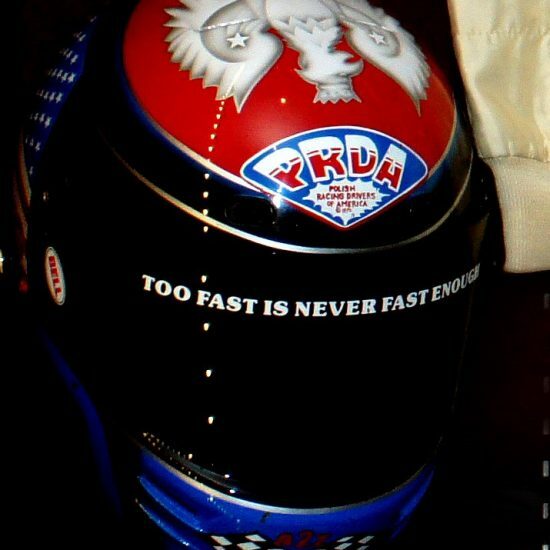 Recognized for his achievements, he received the Ted Mayer Award for the Most Promising Driver of the Year. Motor Age Magazine and County Magazine named him “Driver of the Year.” As a concession to announcers who frequently mangled his name, he became known as Tony A to Z. Moving to open-wheel racing in 1969, he secured the SCCA Continental Formula 5000 Championship in a Dan Gurney Eagle, the only American ever to have done so. 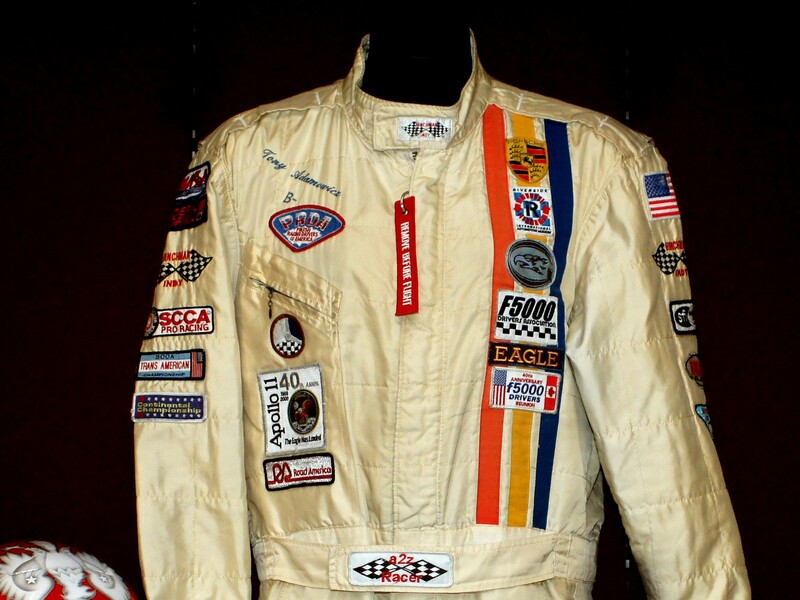 The Eagle landed on the moon the same day Tony raced his Eagle to victory at Road America; the symbolism was not lost. Both Poland and America chose the Eagle as their country’s symbol of strength and freedom. Tony’s grandparents had journeyed into unchartered territory, teaching their families to reach high to become more than they thought possible. Tony had taken flight. Venturing into endurance racing, he placed 1st in GT Class in the 24 Hours of Daytona in a Porsche 911T. In a light-hearted moment, Tony met with Oscar Koveleski and Brad Niemcek about founding the Polish Racing Drivers of America to win sponsors and promote the sport. Using his artistic talent, Tony presented a hand-drawn version of a PRDA emblem, and the idea took off. The organization boasts world-wide membership and Tony remains co-VP. International competition was next in 1970. Tony raced in places he had only dreamed of: Monza, Italy; Johannesburg, South Africa; Le Mans, France. He drove a Porsche 917 and his childhood dream, a Ferrari 312P. The home-spun remedy of rubbing a cut potato across the windscreen to diminish fogging served him well in the torrential rains at 24 Hours of Le Mans. His next venture: the Can Am Series, driving a McLaren M12 and a Lola T70. In Trans Am, he drove a Dodge Challenger and Alfa Romeos. His experience grew. In 1971 Tony continued endurance racing, widening his international scope. He won the 12 Hour at Yahuarcocha, Ecuador in a Ferrari 512-S/M, setting a new track record. In a Porsche 917, he set a new lap record at 9 Hour Kyalami in Johannesburg, South Africa. At Le Mans he came in 3rd, the first American, as well as the first Ferrari, to finish. Again in a Ferrari 512S, he returned to Daytona, placing 2nd in the closest finish in the history of the 24 Hour event. Tony drove an AMC Javelin in Trans Am races and had a string of top ten finishes driving a McLaren M8B in the Can Am series, becoming the highest placing Independent Can Am Driver of the season. At Mt. Fuji Raceway, Japan, he set the fastest track record in a McLaren M12. Because of his stellar performance in World Manufacturers’ Championship races, Tony earned an FIA International Rating from the world motorsports authority, one of only five American drivers to do so. When the idea of running the Cannonball Baker Sea-to-Shining-Sea Memorial Trophy Dash emerged, the PRDA had to be involved. Tony, Oscar, and Brad drove a Chevy van cross-country to second place in 36 hours 47 minutes, just 53 minutes behind Dan Gurney and Brock Yates in a Ferrari Daytona! In 1972, Tony ran World Manufacturers’ Championship races in a Gulf Mirage in Zeltweg, Austria and Watkins Glen, NY, and drove a Ferrari at Le Mans, where he finished first in class. Back in Yahuarcocha, Ecuador, he again was victorious in a Ferrari 512. 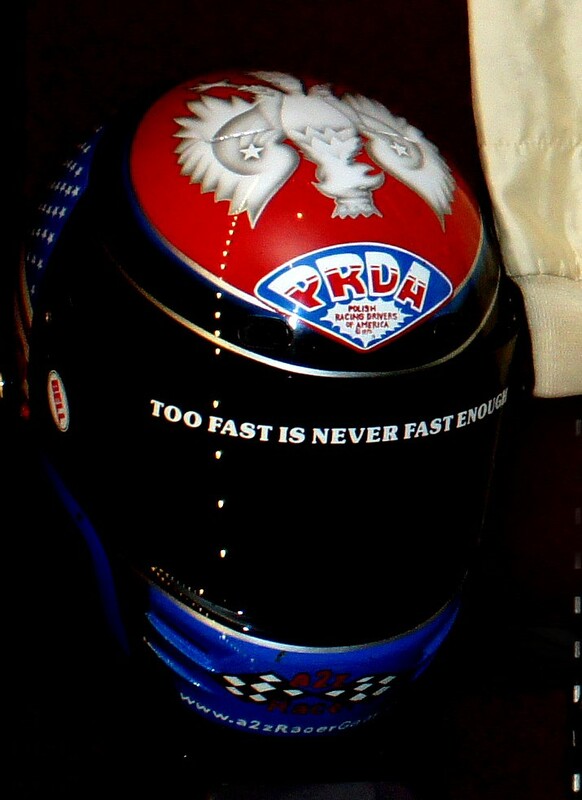 In 1973, Tony drove a Lola T330 in the Formula 5000 Series and Porsches and Ferraris in endurance races. He finished the season driving one-handed with his wrist in a cast, molded to fit the steering wheel. Throughout the 70s, Tony continued to set new records and win first-in-class. He also became the Autoweek cockpit race editor for the Formula 5000 Series, providing insight into the current race scene. 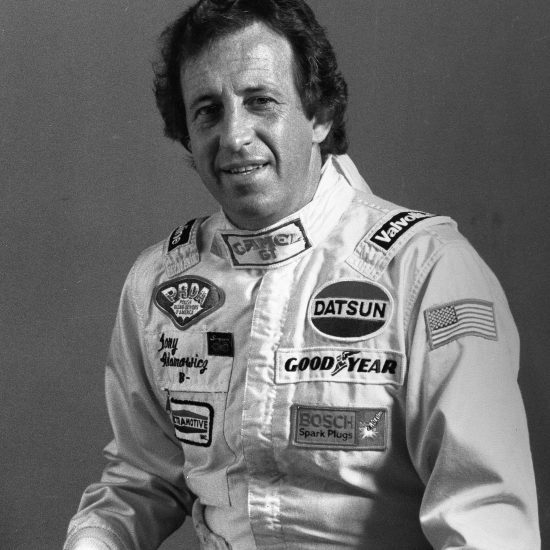 In the early 80s, he entered the IMSA series, driving a Datsun 280ZX, and he and his team won 3 season championships in 1981, 1982, and 1983. Tony retired from racing to raise his son in 1989, but continued his involvement with the sport. Analyzing cars he had driven and the memorable races that had contributed to automotive development over the past 40 years, Tony wrote for motorsports periodicals and gave lectures. In 2008, the Eagle, in which he won the F5000 Championship in 1969, was returned to racing condition. Tony would be the driver. He designed his latest helmet: Wrapping around the base – the American flag. On the top – the proud Polish Eagle. Spreading his wings, Tony raced to victory once again, astounding the racing world by winning the US Formula Revival Championships in 2009, 2011, 2012, and 2014. In a career that spanned over 50 years, Tony’s skill and determination brought him to world-wide venues. Racing over 15 different makes of cars, 6 different types of Porsches, and 6 different types of Ferraris, he earned 9 Championships, countless class wins and lap records, and scores of top-ten finishes. The racing community has honored Tony by choosing him as Grand Marshall in racing events and by inducting him into the Watkins Glen Drivers Walk of Fame. Now the National Polish-American Sports Hall of Fame adds to this recognition. An ambassador for the sport, Tony always had time for others. Most recently, he has shared his experience and passion with people throughout the world via the internet. His fans say Tony will forever possess the Pole Position.